Curl reduction - Website of EcoChic Hair Studio Inc! We superior natural ingredients and certified organic extracts that won’t expose salon professionals or their clients to unnecessary health risks, or further degrade the planet in which we live. The new organic and natural formula, KeraGreen Keratin and Protein Hair System, restores the youth of hair while promoting a healthy lifestyle, and preserving the planet’s fragile ecosystem for future generations. Our exclusive formulation uses L-Cystine, Hydrolyzed Keratin and Collagen, and other active components of certified Organic and natural ingredients to help restore hair, reduce curl, while controlling hair loss and managing frizzy, weak, coarse hair. It is a hair-restoring treatment that will leave the hair smoother, shinier, and more manageable, it will be easier to smooth the hair with a blow dryer, but you will not experience a permanent removal of the original texture. Once the hair is washed the hair will still have curl or a wave to it. 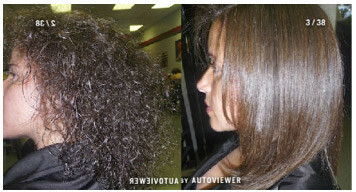 Over time, with the continued use of the product and treatment the hair will begin to appear less textured as the keratin fills in the hair and weighs it down. Curls and frizz will diminish with every treatment. Each head of hair is unique and may respond differently, so please bear that in mind.